Welcome to the ever growing collection of Ghost pictures in The Paranormal Chronicles.com archive. Some of these pictures may very well be hoaxes, some unexplained and some even real. Peruse these incredible photographs of the unknown and decide for yourself and we do hope afterwards that you do sleep well…. These 101 pictures have been proudly brought to you by The Paranormal Chronicles.com, Our You tube channel : The paranormal Chronicles Network and the #1 Best selling true haunting A most haunted house..Read today if you dare. PLEASE NOTE: The Paranormal Chronicles declines offers to monetize our website as we do not wish to risk our viewers viewing pleasure with pop ups, malware, virus’s and spam. So instead we promote independent products produced by people with a passion for the paranormal. So please do feel free to support them. 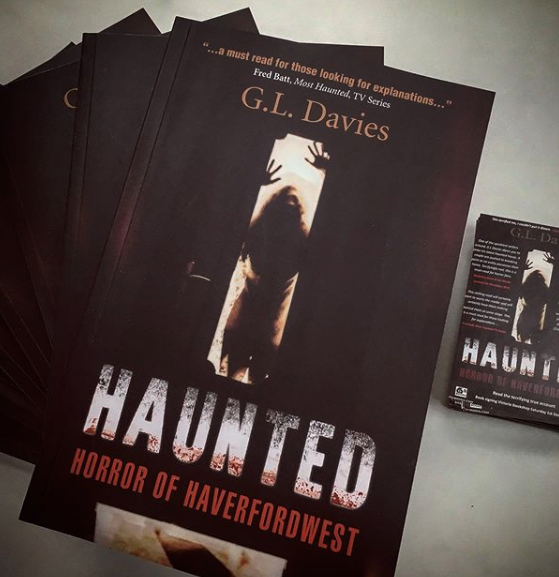 These 101 ghost pictures are sponsored by the bestselling true haunting A most haunted house by G L Davies. Read now the book that URI GELLAR said “I was riveted to every page, I hope the book will be made into a movie some day.” Available now on Kindle, in Paperback and on Audible. Click now to join as thousands already have this chilling best selling true account. On November 19th, 1995, Wem Town Hall in Shropshire, England was engulfed in flames and burned to the ground. As firefighters tried to stave off the inferno a town resident, Tony O’Rahilly, took pictures from across the street using a telephoto lens on his camera. There, rather clearly in one of the photos, is what looks very much to be a small girl standing in a doorway, with the brightness of the flames behind her. No one ever remembered there being a small girl present on scene, much less in that close a proximity to the fire. The photo and the original negative were turned over to a photo expert who decided that the picture was 100% authentic: “The negative is a straightforward piece of black-and-white work and shows no sign of having been tampered with.” In 1677 a fire destroyed many of Wem’s wooden houses. The fire was said to have been caused by a 14-year old girl named Jane Churm, who had been careless with a candle. Churm died in the fire along with several others, and her ghost is said to still haunt the area. Whether there’s such a thing as ghosts or not, it must be said: if this is just a trick, an illusion of smoke and fire that happened to be captured on film, it is coincidence that it just so happened to appear in the form of a girl who also died in a terrible fire at the same location. This photo was taken in 1936 at Raynham Hall in Norfolk, England, by two photographers of Country Life magazine. Raynham Hall was long reputed to be haunted by the ghost of Lady Dorothy Townshend, who died in 1726. It was rumored that her husband suspected her of having an affair and locked her away in a remote corner of the house until her death many years later. The ghost had been seen on many occasions throughout the years when it was spotted descending these stairs by the Country Life photographers, who quickly took a snapshot. This is considered by many to be the most highly regarded and reputable photograph of a ghost yet made. Taken in 1919, the photo show RAF Goddard’s squadron, who served in World War I but on closer inspection a spooky face can be seen in the back row, it’s believed to be air mechanic Freddy Jackson, who’d be killed in an accident two days earlier. Freddy Jackson’s squadron served on board the H.M.S. Daedalus. Freddy Jackson was killed in 1919 when an airplane propeller hit him. Two days later when the squadron assembled for a group photo, Freddy Jackson faithfully showed up, grinning behind the ear of a fellow comrade. His face was widely recognized in this photo by members of the squadron. When a Grandson took a photo of his Grandmother, he didn’t expect to see his Grandfather stood behind her. After her passing the family went through the photos and for the first time noticed the man in the photo. She had lived on her own until age 94, when her mind started to weaken and had to be moved to an assisted living home for her own safety. At the end of the first week, there was a picnic for the residents and their families. A family member took this picture. It was taken on Sunday, 8/17/97, the man behind her is her husband who passed away on Sunday, 8/14/84. Taken at Newby Church in North Yorkshire in 1963 by Reverend K. F. Lord. This is one of the most famous and controversial photographs ever taken, some claim the photo is likely a fake as it’s almost too good to be real, yet experts who have examined the photo say the figure isn’t the result of a double exposure. The “thing” is calculated to be standing nine feet tall, and no one’s found any record of a monk that humongous ever being at Newby Church. Who is it? What is it? Trick of light or something else? This famous photo taken in 1924 apparently shows the faces of two recently deceased crewmen appearing in the waves alongside the merchant ship S.S. Watertown. The faces were seen by numerous members of the crew for several days beforehand and were positively identified as those of two crewmen who suffocated while cleaning out an oil tank a few days earlier. The Burns Detective Agency analysed the negative for tampering and found none. Legend has it Chloe was a slave in the house of the Myrtles Plantation in St. Francisville, Louisiana who had a bad habit of listening at keyholes to the goings on of the residents. Caught one day in the act by the Master of the house, he lopped off her ear as punishment, forcing her to wear a green scarf over her head to cover the wound. As punishment, she baked a cake with oleander leaves, a common plant in the south that is immensely poisonous. Though the master of the house was her target, her victims became his wife and two daughters, who died in agony a couple days after eating the cake. Chloe fled the house and was lynched by field slaves on the plantation for the wicked light she cast on the rest of them. This photograph of the library in Combermere Abbey was taken by Sybell Corbet in 1891. The figure of a man can faintly be seen sitting in the chair on the left. His head, collar and right arm on the armrest can be clearly made out. This is reputed to be the ghost of Lord Combermere. The second Viscount Lord Combermere died in 1891, after being struck by one of London’s first motor cabs which was electrically powered. While Sybell Corbet was taking the above photograph, Lord Combermere’s funeral was taking place over four miles away. This famous ghost photograph was taken in 1959 by Mable Chinnery. After visiting the grave of her mother, Mable turned and took a picture of her husband, who was waiting for her in the car. What Mable didn’t expect was her mother coming along for the ride. This shot was taken under carefully controlled circumstances with numerous witnesses present, making fakery especially difficult. Taken in 1978 at a Sunnyvale, California Toys-R-Us store known for an inordinate amount of paranormal activity, the picture was shot by the crew from the TV program That’s Incredible! The infra-red film image of the young man leaning against the wall was not seen by any of the people present at the time, nor does he appear in the high speed footage shot from the same vantage point at the same time. There’s a story that in 1869 a young man died at the location where the store now stands from an accidentally self-inflicted axe wound. WATCH NOW: TPCN SPECIAL ON EVP’S, HAUTINGS, PARANORMAL INVESTIGATION, UFO’S AND MORE! The Ghost on the Beach. A mysterious dark hooded figure stands at the water’s edge. The Sceptics’ explanation is that the figure is an illusion created by an indentation in the rock face. What do you believe? Ghostly apparition or optical illusion? This picture was taken in 2008 at the then-under-construction Decebal Hotel in Romania. There had long been reports of a ghostly woman in a long white dress on the premises.Could this be her? The Woman at Corroboree Rock, Australia. This picture, taken in 1959 and seems to show a semi-transparent woman in a long gown standing at the edge of a group of trees, holding what might be a camera or pair of binoculars. This picture, originally intended only to capture the spiral staircase in the Queen’s House section of the National Maritime Museum in England, was taken in 1966. A shrouded figure appears at the bottom of the stairs — possibly corroborating the many reports of strange encounters surrounding them over the years. A picture taken in 1975 of Diane Berthelot sitting in the pews at Worstead Church in Norfolk, England, appears to show a creepy white figure sitting just behind here, though nobody else was present at the time the picture was taken by Diane’s husband Peter. What do you believe? This photo was captured from the St. Augustine episode of The Travel Channel’s Ghost Adventures. Captured by a tourist at Castillo de San Marcos, St. Augustine, Florida. The team from Ghost Adventures were chatting to Cal Colgan who produced this photograph, apparently showing the ghost of Andrew Ransom, a rather ruthless English pirate, taken by a visitor. In these ghost photographs, the ethereal figure on the left, who was not seen by anyone else at the time, is wearing the ruffled collar so much of the period that Ransom was in St. Augustine, in the late 1600’s. His ghost has been seen numerous times around the Castillo area, by both locals and tourists. Members of the Cheshire Paranormal Society took this fantastic picture on Packhorse Bridge, Caergwrle, Wales. Although this was just a random shot, orbs had been captured by the group already and several members felt uneasy at the time. It’s believed a number of ghosts haunt this bridge possibly in connection with a former burial ground nearby, for which the bridge was the entrance. This photo was taking at Bachelor’s Grove Cemetery in Illinois. Many experts in the field of the paranormal consider it to be one of the most haunted graveyards in the world. So what is so unique about a photo of a women sitting on a stone in a graveyard? According to the people who took this photo the woman was not there when the picture was taken. The photo was taking by Mari Huff who is a member of the respected paranormal investigating group Ghost Research Society. In 1996, Ike Clanton thought it would be a splendid idea to deck himself out in cowboy attire and have his friend take a picture of him while he stood in Boothill Graveyard at the famous Tombstone, Arizona. Upon examining the picture Clanton noticed a man in the background of the photo that was not there when the photograph was taken. Clanton was intrigued by this and set out to recreate the photo with a friend standing in the background and discovered it was impossible to recreate the picture without having the legs visible. CLICK ADVERT TO READ NOW..if You DARE!!! An eerie image of a figure in period costume at a Scottish castle has spooked experts conducting the biggest ever investigation into photographic evidence for ghosts. The picture, taken in May 2008, appears to show a man or woman in a ruff peering out of a barred window at Tantallon Castle. No mannequins or costumed guides are employed at the castle, and three photographic experts have confirmed that no digital trickery was used on the photo. Even confirmed ghost sceptic Professor Richard Wiseman, who led the study, admitted to being puzzled. This photograph was taken by Karen Collett on the Bakerloo Line, London, in the early 1980’s. Taking a picture of her family in the train, this eerie image appears reflected in the glass of a man in an electric chair with blue sparks shooting from his hands. It was Taken with a ‘point and shoot’ 110 camera. A wax figure of Bruno Hauptmann, who was accused of the kidnap and murder of the Lindbergh baby, is in Madame Tussaud’s Wax Museum and shows him in the electric chair. The image is identical to the one in Karen’s photo except there are no blue sparks in the Museum exhibit. Despite sceptic’s claims that it must have been a poster in the Underground tunnel, Madame Tussaud’s can find no record of any such poster ever being manufactured. HELLFLIX dares to brave the movie madness of Horror, Cult and B movie depravity. Press Play now to watch! This snap appears to show the ghost of a samurai soldier standing behind a little girl. The photo was taken along the Japanese shore in Kanagawa – supposedly near tombs of soldiers who died in battle. It shows eerie black boots behind the girl’s legs, giving the impression he is looking out to sea. The disturbing images were uploaded to Reddit with the user ‘Obiaruf’ insisting they have not been Photo shopped. What do you think? A woman exploring a derelict hospital was left stunned after a photo she took in the spooky building appeared to show the ghostly figure of a doctor. Jamie-Leigh Brown, 21, was walking the abandoned corridors of St Thomas’s Hospital in Stockport – which closed down in 2004 – when she took the chilling picture. She did not check the photo at the time as she and her and friends were too concerned with the footsteps they were hearing above them – despite the hospital having no usable staircases. The group became spooked and fled the building after only a few minutes and it was not until later that Ms Brown discovered the haunting figure lurking in the background of the shot. One Family got a severe case of the creeps after seeing a ‘spectral figure’ in the background photo bombing this shot of two children in front of an 1812 building. The spooky picture of Mayrian Islam, 11, and nine-year-old Ryhan Kaliqwas was taken in Roundhay Park, Leeds, West Yorkshire, next to the Victorian folly.On closer inspection a strange cloaked figure is standing on steps in the background, but the family insist no one else was there at the time. Peaches Geldof claims a mysterious hand which appeared in a selfie she took belongs to a ghost. She snapped the picture of herself with son Astala in the bathroom of her Kent home. But when she looked at the photo she noticed the ghostly hand by the side of her head and posted it on Instagram saying: “Close up shot of the mystery ghost hand in pic I took of Astala and me In the bath And no that isn’t my hand- one of mine was round his waist to hold him during the photo, the other holding the camera to take the shot.” Peach’s body was found on 7 April 2014 at her home Kent. Geldof was found dead in a spare bedroom surrounded by all the paraphernalia of heroin abuse. This disturbing early 20th century photograph of a bureau was taken by Montague Cooper, a well-respected photographer at the time. A furniture collector, who admired the bureau’s craftsmanship, requested the photographer to take a photo of the bureau. After it was developed, she was so stunned to find that a hand seemed reluctant to part with the piece of furniture. Could this be an example of an early attempt of tampering with the picture to create a chilling effect? This picture made the rounds on the internet a few years ago and though that alone is enough to make one suspicious of its authenticity; it’s still an interesting photo. Supposedly taken in Manila (Eastwood City), the story goes that these young ladies had asked a passing stranger to photograph them with their Nokia 7250 phone camera and the transparent figure on the right appeared. Fact or faked? The alleged sighting is the latest in a string of bizarre rumors to emerge after the death of Michael Jackson. These include reports the late singer will tour the world via hologram and that he will was buried without his brain. But after this photo of an alleged shadowy figure seen at the Never land Ranch was posted on YouTube, rumors have spread like wildfire across the internet. Viewer comments and chat forums have debated in earnest the possibility that the shadow belongs to Jackson himself though evidence seems likely it is just a member of a TV crew that was setting up at the property. The story of love between celebrities Chito Miranda and Neri Naig has gone a long way. Chito Miranda is the frontman of one of the most successful bands in the history of Philippine music industry while Neri Naig is one of the versatile actresses of this generation have tied the knot and their wedding is much talked about. One of their wedding pictures has gone viral due to a sight of a “ghost” witnessing the newlyweds’ reception have appeared. There are speculations that it is indeed a ghost since the location Tagaytay is said to be haunted and the position of the “ghost” seems to be appropriate for any guests to stay in, It could also be a case of bad lighting from the camera and that ghostly figure was a guest as well. The family of a young girl have claimed she had to be exorcised of an evil demon after visiting a haunted house owned by ‘Ghost Adventures’ host Zak Bagans. The unnamed youngster apparently became ‘possessed’ by a malevolent spirit inside the home in Gary, Indiana, once described as a ‘portal to Hell’.The possession allegedly occurred during filming of Bagans’ latest documentary for which he asked former residents of the property to retrace their footsteps through the haunted building. A spooky figure was pictured in the window, and audio recordings were made of ghostly voices in 2012. On January 22, 1985, the Coventry Freeman organization were having a dinner event at St. Mary’s Guildhall in Coventry, U.K. Everyone in the group had her or his head bowed in prayer when this photo was taken — including a towering, mysterious figure standing top left. The strange cowled spectre appears to be wearing clothing much like a monk’s frock from another time. Lord Mayor Walter Brandish, who was present at the dinner, said there was no one at the event who was dressed like that, and he could not explain the presence of the interloper in the photo. St. Mary’s Guildhall dates back to the 14th century and served as a prison for Mary, Queen of Scots. Sefton Church is an ancient structure (started in the 12th century and finished in the early 16th century) in Merseyside, England, just north of Liverpool. This particular photograph was taken inside the church in September, 1999. According to Brad Steiger’s Real Ghosts, Restless Spirits and Haunted Places, where this photo was found, there was only one other photographer in the church beside the person who took this picture. Neither of them recalled seeing the ghost or any flesh-and-blood person standing there who could account for this image. Because the figure is all in black, it has been theorized that the apparition could be that of a church minister. This photograph showing a partially transparent dog with head much fainter than the rest of its body was taken by retired C.I.D inspector Arthur Springer formerly of Scotland Yard. It was taken during a tea party in 1916 and the appearance in the print of a ghostly dog remains unexplained. Due to the photographer’s profession, it is thought to be unlikely faked. A curious Photograph was taken in Switzerland by Major Wilmot Allistone. Although nothing was seen at the time of exposure, a ghostly kitten appears in the hand of the boy. The mystery deepens as when the family were presented with the picture they did recognise the kitten. The Kitten had been mauled and killed by a dog weeks before the picture was taken. Is it Fake or a Purrfect paranormal photograph? You decide. This ghost picture was taken at the Crumlin Road Prison in Belfast, Northern Ireland. The prison was host to seventeen executions and at least a few murders by inmates. There were numerous suicides inside the haunted prison as well. Today, the prison serves as nothing more than a tourist attraction. This photo was taken by a tourist who had posed in an empty coffin as a prank. Upon review of the picture, the man noticed that he may not have been alone inside the coffin. The photo was allegedly taken near cell thirteen, where prisoners would spend their last night before being executed by hanging. The walls adorned with pictures of Pembroke throughout the ages had one peculiar image at a local cafe. The photograph appears to have the shadowy figure barely visible on the left hand side. The picture was taken in West Wales around 1903. A copy was taken and presented to a local photography expert. He did not think it is or was intended as long-exposure photography or time-exposure photography. The most intriguing part is said to be the area around the figure which does not seem to be affected at all. Further research deems that this is just an optical illusion caused by items in the shop window, shadow’s and glass reflection. What do you think? Photos of fire that devastated chapel in Llanelli, South Wales, have caused social media storm after claims of faces in raging blaze. Are these the haunting faces of lost souls screaming in the flames of a burning church? Social media users, who viewed the image on Facebook and claim to be able to see the visages in the fire licking the roof. When posted on Facebook, the picture was met with comments claiming a spooky phenomenon. One of royalty’s most alarming mysteries may have been solved be a spooky snap taken by a psychic artist. The two princes in the tower is one of London’s most enduring mysteries – but this photograph could show their ghosts. Captured by a medium and psychic artist, the picture appears to show the two famous princes in the Tower of London – thought to have been murdered by their uncle, Richard III. Edward V and his twin brother, Richard of Shrewsbury disappeared in 1483 and their story has been shrouded in mystery ever since but Christine Hamlett believes she has the answer – their uncle, Richard III, brutally murdered them. GHOST hunters who were exploring an old community hall are claiming a paranormal coup after snapping “the eerie figure of a man” sat in the “haunted” building above a plague pit. Spook chasers Jodie Carman and Chris Hunter claim “the figure’s head and shoulders can clearly be made out in seats a few rows in front of her” and appeared after a series of unexplainable bumps and noises, while they were still, and a woman apparently being possessed. The pair, who are refusing to identify the building in Norwich, said they were so stunned at seeing the “apparition” at the time, they shone a torch, but the chair was empty. They insist that no one else was in the old community venue at the time the photo was taken. Alex Walton got a fright when uploading pictures of a celebratory performance by Nigel Ogden at the Sidholme Hotel. The translucent figure of a woman appears to be watching BBC Radio 2 The Organist Entertains presenter Mr Ogden, sending a chill down the spine of those who were sat nearby. Nigel Hyman, who can be seen seated next to the supposed spirit, insists there was no-one next to him. Theories behind the apparent apparition include her being the ghost of a music-loving countess from the 18th century – or just someone standing behind a glass door who was given a paranormal projection through a trick of the light. A medium has described the shape as a ‘spiritual lady’. Animal psychologists are baffled by the bizarre phenomenon that has seen up to 600 dogs jump off the bridge for no apparent reason. Explanations range from the curious canines being over-excited, to ghosts haunting the century-old bridge next to Gothic castle Overtoun House. Some locals in West Dunbartonshire, Scotland, even claim it could be the spirit of the ‘White Lady of Overtoun’ who has been sighted there for over 100 years. Is this the spine-chilling moment an elusive ghost said to have haunted a British castle for centuries was finally caught on camera? Birmingham couple Dean and Amy Harper reckon so, after they snapped what they believe is the fabled Grey Lady of Dudley Castle – a notorious ghost said to prowl the grounds of the building dubbed England’s most haunted. The tourist attraction has long boasted spooky goings on and the Harper’s phantom photo is sure to add fuel to the fire that the castle is a paranormal hot-spot. The pair snapped a simple shot of Sharington Range – buildings erected within the castle in the mid-1500s. But they soon spotted some weird goings on as the photo showed upper rooms in the courtyard glowing red and a blurred figure in grey standing in an archway. A ghost hunter claims she has captured the ‘clearest photo yet’ of the notoriously violent poltergeist known as the Black Monk of Pontefract. Paranormal investigator Claire Cowell believes she has taken a chilling image showing the arm of the eerie figure in a monk’s robe clutching rosary beads. She was inside the former home of the Pritchard family at 30 East Drive in Pontefract, West Yorkshire – the site of one of Europe’s most notorious and powerful alleged hauntings The family said they were subjected to years of torment by the so-called ‘Black Monk of Pontefract’, who is said to still haunt the building. THIS creepy picture taken on a train used in the Harry Potter movies seems to show a ghostly girl standing in the carriage. The snap was taken by Micky Vermooch during a 1940s themed party last weekend – and there were NO children on board at the time. The 63-year-old, who took the photo on his phone, didn’t see anything at the time and was shocked when he looked back at the photos. 49 .The pregnant ghost of Oxburgh Hall. A SPOOKED woman has claimed to have captured the ghost of woman who reportedly went missing 300 years ago on camera at a national trust. Diane Barron, 46, from Norwich, Norfolk, snapped the eerie spirit leaning with two hands on the wall of the bridge at National Heritage site Oxburgh Hall.Covered in misty black robes, the ghoul appears less than a meter away from another visitor who was oblivious by her close-encounter. Mrs Barron was on a trip to the medieval family home built for courtier Sir Edmund Bedingfield in 1482. Eagle-eyed Mrs Barron, only spotted the unusual figure when reviewing her pictures and is certain it must be a spirit. The unexplained spooky figure was spotted on CCTV inside Warrington Market wandering between the shops at night and customers are puzzled over whether the images are real. What do you believe? Gaynor Issitt’s thuggish home invader has made her home into a terrifying haunted hell and no one can get rid of the spirit who talks in a cockney accent .A woman who has lived in the same house for 36 years says she has been repeatedly attacked and tormented by a ghost calling himself Jack the Ripper. Gaynor Issitt said she has even been dragged out of bed by her ankles, punched and whacked round the head by the thuggish spook. The terrifying tale has convinced paranormal investigator Mark Vernon that it’s the real Jack the Ripper and he’s back on the attack in Leicestershire. Mr Vernon discovered the evil entity six months ago, when he went to explore the Ripper’s latest alleged target in Braunstone. Ms Issitt has called in countless priests and paranormal experts over the years – and she said most run screaming from the spooky property. But when ghost buster Mr Vernon visited, he told the 58-year-old that the evil spirit that’s been battering her is none other than Jack the Ripper. According to her, the angry ghost also burns bibles, and takes a particular dislike to religious people. This spooky CCTV footage appears to show a ‘ ghost ‘ walking through a restaurant built on the site of an underground crypt. Manager Paul Wood got a fright when his phone alerted him to something setting off the security cameras in The Keys restaurant. But he was shocked when he glanced at the screen to see what looked like a bright white apparition passing through the eatery, based in the crypt Huddersfield Parish church’s vault in West Yorkshire. Louise Murphy caught what seemed to be a paranormal being on camera while taking her nine-year-old son out to the Riverside Museum in Glasgow .A mum-of-two who was enjoying a family day at a museum was left spooked when she caught what she believes could be one of the clearest images of a GHOST on camera she has ever seen – a waving little girl. Is this a real ghost? PARANORMAL investigators believe they have proved ghosts really exist after capturing an eerie apparition of a woman in a former coal mine. Ghost hunter Jimmy Devlin, 44, is convinced the transparent figure could be the spirit of of a long-dead female coal sorter. He committed the “spectre” to camera during a paranormal investigation at Lady Victoria pit in Newtongrange, Midlothian, where Scotland’s National Mining Museum is now based. He thinks it resembles the women depicted in recreations of coal sorters from the time which are available on the museum’s website. PARANORMAL investigators are doing somersaults over new footage which shows a bizarre orb blast past a security camera. The footage has been handed to the Mutual UFO Network (MUFON) for further investigation.It shows a security camera on the outside of an address in Longmont, Colorado, recording from a fixed position on Friday. Although MUFON is devoted to investigating UFO sightings, it will log and look at other paranormal events in some cases. A mother believes she has captured a picture of a ghost sitting behind her and her family at a cinema. Emma Johnson, 35, took the picture of herself with George, six, Ava, eight, and seven-month-old Harper. They watched Finding Dory together at the cinema in New Brighton, Wirral, then went home and looked at the picture. Emma said: ‘I wanted to take a selfie because it was the first time that Harper had been to the cinema but I was really self-conscious so I made sure that the cinema was empty. She put the picture online and some have said she had edited the picture, but she insists it is the real deal. Real or fake? That’s the big question surrounding the latest social media buzz – a photograph posted by a man who says he witnessed the scene of a fatal motorcycle accident from afar, snapped a quick picture, and noticed, while looking at it and posting on Facebook, a shadowy whitish figure hovering above an emergency response official’s head. If you ever feel like you’re being watched or get a cold shiver down your spine, you might sense that a spirit is close by – but most people wouldn’t bet on being in the company of a former prime minister. A 23-year-old coach driver believes he has captured the ghost of none other than Sir Winston Churchill frequenting a platform on the London Underground during a stay in the capital. People who live in the area believe the apparition could be the victim of a road accident back in 1989 .A spooked out motorist believes she’s captured on video the ghost of a dead bride hovering at a crash hotspot where a newlywed died almost three decades ago. Ms Dmitrieva, who was travelling with another woman, checked her dashcam which appeared to confirm that she really had seen something. But the driver who recorded the haunting footage believes that the spectre she saw could have been a victim from 27 years ago. The clip has been called a “sensation” by paranormal investigators and is going viral online after being uploaded to video-sharing websites. Are there ghostly goings-on at Henry VIII’s palace, or is that hazy image of a fellow in fancy robes just a bit of Christmas cheer? Closed-circuit security cameras at Hampton Court Palace, the huge Tudor castle outside London, seem to have snagged an ethereal visitor. Could it be a ghost? A camera installed at one of the U.K.’s oldest pubs has captured what seems to be a ghostly apparition behind the bar, and the footage has captivated the British press. The appropriately named Ye Olde Man & Scythe is the fourth-oldest pub in the U.K. It’s been standing in Churchgate since 1251. According to the management, the pub’s surveillance system stopped recording around 6:18 a.m. on the morning of Feb. 14. When they went back to check the footage, they were confronted with the flickering image of what could conceivably be a ghostly figure standing in the center of the frame. The famous Bungendore ghost. This shot was taken in the Royal Hotel, Bungendore by a journo in 1949 for a local newspaper feature. Photo is on display with other old Pubobilia including some documents from 1880 found when the old fireplace was renovated. In 1982, photographer Chris Brackley took one of the most famous ghost photos ever inside the historic St Botolph’s church. When the photograph was developed he was astonished to see a figure standing in old-fashioned clothes. High in the church’s loft, seen in the upper right-hand corner of his photograph, is the transparent form of what looks like a woman. According to Brackley, to his knowledge there were only three people in the church at the time the photo was taken, and none of them were in that loft. The negative was subjected to considerable expert analysis, which revealed that there was no double exposure to the film and it was also proved that none of Chris’s equipment was faulty. The only explanation for the mysterious figure was that someone must have actually been standing on the balcony when the picture was taken. A few years later Chris was contacted by a builder who had been employed on restoration work in St Botolph’s crypt. He explained that, in knocking down a wall he had inadvertently disturbed a pile of old coffins. One had come open to reveal a reasonably well-preserved body the face of which bore an uncanny resemblance to the figure that had made an uninvited appearance in Chris’s photograph. One of the strangest intruders was surely the grey lady who appeared on a photograph taken by Harry Dack in the backyard of his home in Carlin How in 1967. The identity of the lady, who appears to be looking at Harry`s grandson Neil and his Jack Russel pet Kelly, has never been solved. While visiting this ancient castle with her son, a woman decided to take a photograph with him playing in the background. She was shocked to discover a dark phantom lurking behind him, with it’s back to the camera. Sefton Paranormal Investigators were ghost hunting in Stanley Palace on June 28, 2014 when they captured what appears to be ghostly evidence. The investigation’s footage reportedly shows the image of a person standing on a staircase inside the 16th century Tudor building, the Southport Visiter reported. The ghost of a drowned man has been caught on camera wandering through a tunnel while traffic drives through him. At least that’s according to long distance lorry driver George Furst, whose colleague Stephen Smyth took the snap as they drove into the tunnel in Cork, Ireland. When the pair checked the photo, the spotted what they believe could be a Downton Abbey period spectre, who met his end in the area. This baby was three weeks old and was resting comfortably in her car seat when the mother took a picture. After the picture was developed, she saw the gray image next to the baby that appeared to be another baby. The mother had lost her first baby due to a miscarriage and thinks that this was her lost baby coming to watch over her newborn sister. This photo was sent to irishmirror.ie by Elaine from Limerick of what appears to be a ghost. Limerick has a rich history of sightings of ghosts and spirits across the history, and here is one proof. Elaine said: “We know our kitchen is haunted, the first resident of this house, an old man is stuck here. We later found out he died of a heart attack in the kitchen. This is a photograph that was taken in 2009 by a some construction guys, who were working for a roofing outfit from Tremont, Illinois Koch Construction. One of their workers snapped this photograph with his camera phone. The story goes that they were hired by the new owners of the house. According to them, the lady who lived there, had passed away nearly three months before. They had been working on the house for two days and the house was completely vacant. A cafe owner found himself Ghostbuster rather than crime-stopper, when his CCTV camera captured footage of a supernatural intruder. Dan Clifford, 35, was startled by the images of a ghostly female figure hovering in his locked shop, before disappearing into thin air. He said: “The first time I saw the shadow moving on the old camera my heart went nuts as I thought there was an intruder in the shop. “But when I looked closer I realised it couldn’t be a live human being – I could see right through it.” The apparition is just one of a number of encounters with the other side at the Curiositeaz Vintage Tea Room in Perth, Scotland. This photo was taken during remodeling of white house around 1950 by National Parks Service photographer Abbie Rowe and can be found in David McCullough’s book Truman. In the background is clearly visible a dark shadow figure of a man. On November 22, 1913, a teenager named Doreen O’Sullivan drowned in an Australian swimming hole. At least one woman believes Doreen’s ghost appears in the photo above, taken in the same swimming hole last year. This photo was taken by the wife of the coach seen in the picture, inside the Ford Island gymnasium at Naval Station Pearl Harbor. Look carefully in the top right corner of the picture. There are three prominent ghost-like figures that appear in the photo. The photo was taken in the early evening with a digital point-and-shoot camera. Here’s something interesting: The evening this photo was taken was also team “picture night”. That’s why the lady who took this had her camera with her. As well, a professional photographer was present and took lots of photos inside the gym that evening. There is no reason to doubt the integrity of the photo, especially with all of the stories over the years, and the history of that building and the island. A long-time employee on base told that building once also served as a huge pool hall, bar and dancefloor. A place where sailors wanted to congregate. As well, the ancient Hawaiians apparently used Ford Island as a ceremonial place. This ghost photo was captured by Dr Kimberly Molto (research scientist specializing in neurobiology in Ontario) in 1938, who identifies the figure seen in the photo as her deceased husband. The photo was taken several years after he died of a massive coronary in the basement that he had been renovating. This woman was visiting the Fleet Air Arm Centre in Yelverton, Somerset, in 1987. Posing for the photo, she said she felt strangely cold, though it was a hot day. She also claims she was the only one in the aircraft… so who is that sitting to her right? Robert A. Ferguson, a spiritualist and the author of Psychic Telemetry: New Key to Health, Wealth, And Perfect Living, was speaking in Los Angeles, California, on November 16, 1968 when the photo above was taken. He believed his brother Walter, who died in 1944 during World War II, was standing beside him during the speech and he just may be right. A strange legend surrounds a railroad crossing just south of San Antonio, Texas. The intersection of roadway and railroad track, so the story goes, was the site of a tragic accident in which several school-aged children were killed – but their ghosts linger at the spot and will push idled cars across the tracks, even though the path is uphill. The article included a photograph submitted by Andy and Debi Chesney. Their daughter and some of her friends had recently been to the crossing to test the legend, and she took some photographs. Inexplicably, a strange, transparent figure turned up in one of the photos. “They had no idea that it was in the picture until the next day when I printed out the picture and showed them,” said the Chesneys. Other readers who have viewed the photo think it shows a little girl with a dog sitting at her feet.What do you think? While touring the historic House of the Seven Gables in Salem, Massachusetts – the birthplace of American author Nathaniel Hawthorne – Lisa B. snapped this remarkable photo. The ghostly image of a small boy seems to be in the shrubbery, peering over the wooden fence. The most amazing part of the story of this photograph is that she subsequently did some research about Hawthorne and the house. While looking through a library, she came across one of Hawthorne’s books, Twenty Days with Julian & Little Bunny by Papa. On the cover of that book is a portrait of Hawthorne’s five-year-old son, Julian. And as you’ll see by clicking on the photo at left, the portrait of little Julian bears a striking resemblance to the ghost in Lisa’s photograph. In 1982, photographer Chris Brackley took a photograph of the interior of London’s St. Botolph’s Church, but never expected what would appear on the film. High in the church’s loft, seen in the upper right-hand corner of his photograph, is the transparent form of what looks like a woman. According to Brackley, to his knowledge there were only three people in the church at the time the photo was taken, and none of them were in that loft. These two photos were taken in 1988 at the Hotel Vierjahreszeiten in Maurach, Austria.Several vacationers gathered for a farewell party at the hotel and decided to take a group photo. One of the party, Mr. Todd, set up is Canon film camera on a nearby table and pointed it at the group. (The table is the white band at the bottom of the photos.) He set the self-timer on the camera and hurried back to the table. The shutter clicked and the film wound forward, but the flash did not fire. So Todd set the camera for a second shot. This time the flash fired. The film was later developed, and it wasn’t until one of party members was viewing the photos that it was noticed that the first (non-flash) photo showed a somewhat blurry extra head! No one recognized the ghostly woman, and they could not imagine how her image appeared in the picture. Besides being a bit out of focus, the woman’s head is also too large compared to the other vacationers, unless she is sitting closer to the camera, which would put her in the middle of the table. The photo was examined by the Royal Photographic Society, the photographic department of Leicester University, and the Society for Psychical Research, all of which ruled out a double exposure as the cause. Several unnerving instances of ghost and poltergeist activity were reported by the management, staff, and customers of the Godfather’s Pizza restaurant in Ogden, Utah in 1999-2000, prompting an investigation by Utah Paranormal Exploration and Research (UPER). Phenomena included: The sighting of several spirits, including those of a man, a woman, and two boys .A jukebox that played by itself, even when unplugged .A tile floor that inexplicably bulged up as high as ten inches, then leveled itself; a later examination showed nothing out of the ordinary beneath the tile and the concrete was intact. As many as 40 fluorescent light tubes flew out of their boxes and smashed on the floor . Mysterious whistling was heard from the kitchen several times. UPER’s investigation found that the restaurant might have been built upon a very old pauper’s field — a cemetery for the poor. It also resulted in this photo, taken by Merry Barrentine, UPER’s general manager, in 2000. This misty apparition was actually seen with the naked eye for a few seconds as it materialized in the middle of the room. This amazing photo was taken by photographer and graphic designer Neil Sandbach in 2008. Neil was photographing some scenic shots at a farm Hertfordshire, England, as part of a project for wedding stationery; the couple planned to have their wedding ceremony held there. Later, Neil was astonished when he examined the digital photo on his computer. There, as if peeking around a corner at him, is a ghostly, white, almost glowing figure of what looks like a child. Neil says he is quite sure there was no one there at the time. There is further corroboration that this is a true ghost photo. Neil had shown the couple the anomalous photo, and before the wedding they asked the staff at the farm if they had ever had any spooky experiences there. They did not mention Neil’s photo. Indeed, they admitted that the figure of a young boy, dressed in white night clothes, had been seen on several occasions around the barn. A woman has told of her terror at discovering a ghost had photobombed her selfie. The picture of the girls was ruined when the ghostly figure of an elderly woman in Victorian clothing sneering at them from behind. The spooky apparition was caught on camera by pals Victoria Greeves, 22, and Kayley Atkinson. 23, as they enjoyed a girl’s night out in Newcastle-upon-Tyne on Sunday evening. Fans of a selfie, they had been enjoying a drink at the virtually empty Slug and Lettuce pun when they decided to take the snap. But after striking their best pose together the girls noticed there was a third person in the photo – which appears to be an elderly lady dressed in Victorian clothing. A Saturday night bonfire was one to remember for a couple dozen teens and adults gathered in a Dinwiddie County yard. The flames or conversation isn’t what made the gathering memorable, rather what was spotted on Social Media, after pictures from the night were posted. “You can obviously see a face right there,” said Zach Everette, who was sitting around the bonfire when the picture was taken. “That definitely wasn’t there when we were sitting there,” Everette said of the ghostly figure. “It’s a ghost,” said Shelly Ballard who was standing beside the photographer when the picture was taken. She and others are adamant that no person was standing there. “There’s no way anybody could have been standing right there, it’s a hole,” said Ballard. In 1935 FBI agents swapped gunfire for six hours with Ma and Fred Barker, gangsters on the run in a rented lakeside home in Ocklawaha, FL. When the gunfire stopped, Ma was dead in a bedroom, clutching her machine gun. Fred had been shot in the back of the head. The home owners have for years reported hearing voices and furniture moving. Others claim the ghost of Ma Barker has confronted them. In 2012 Lane DeGregory and myself were in the home doing a real estate story about the historic home for sale. I was alone in the bedroom Ma died in, taking pictures out the window, and the mattress fell through the middle of the antique bed frame. I hadn’t touched it. I used to have an antique bed frame. I know modern mattresses are a bit smaller than old frames. They can easily fall through the middle if they get wiggled. I am more of a believer in good ghost stories than in actual ghosts…but…when that mattress dropped, I was outta there. All the way outta. Down the stairs, out the door and in the front yard outta there. I was photographing the house with a Speed Graphic camera, the old fashioned kind they used in the 1930’s. Before we left I shot four or five pictures of the front of the house and got them processed a few days later. Looking at the sheets of film on the light table, I saw something creepy in the doorway. I scanned the film, zoomed in, and immediately got creeped out. My first thought was “And stay out!” My second thought was that there are shadows in windows of all houses, all the time. Maybe we only look for ghosts in the spooky ones? Mum panics as BLEEDING ghost soldiers stalk her children at historic battleground Charlotte Harding, 30, visited St Fagans National History Museum in Cardiff last month and to her horror two uniformed ghosts can be seen in the bushes. She was left unable to sleep after discovering the Battle of St Fagans took place in 1648 in which around 200 soldiers were killed. Her research also revealed that Parliamentary uniforms looked “just like” what Charlotte caught in her picture. She added: “I was very spooked out when I got home, only because my child is playing there so the mother side of me is reacting. If I was on my own I wouldn’t be as bothered. Here is a spooky Snapchat image that will really send shivers down your spine. A teenage girl was sending a picture to her pal, but what seems to appear behind her in the image will have you questioning whether ghosts exist. Grainne Dowdall’s sister Sinead explained that the 14-year-old was just sending a standard picture to her friend from an upstairs bedroom in their home when the creepy presence was spotted. It looks like a ghostly female figure is peering in the window as the picture is being taken. Is it a ghost? Is it a trick? One Lincoln spectre hunter decided to investigate reports of supernatural activity at his local graveyard, and has shared a curious video of his discoveries. In the video, published on Youtube on November 7, the local cameraman explained that he had heard of a number of sightings from family members and locals of ghosts in the mystery Lincolnshire cemetery. “I want you to take a look and let me know what you think before I make any claims and say that it’s a ghost”, said the video maker before highlighting what he describes as a “greyish apparition-type thing” in the photos. In a second picture, he described what appears to be a moving “smoke-like” object. Do you think the local ghost hunter has captured a spectre on camera? AN EERIE photo of what appears to be the ghost of a little girl was allegedly captured in a jail where IRA terrorists were once held. Carly Foster, 25, was on a paranormal tour of Crumlin Road Gaol in Belfast with her boyfriend, Mark Whittle, when she claims she captured the spooky snap. In the picture a ghostly figure of a young girl can be seen standing in the doorway of a jail cell – but in photo taken just seconds before, the entrance had appeared empty. Carly – a student at Queen University – told Belfast Live: “It was the wing [where] I felt the most weird and unsettled in and it was freezing cold. Crumlin – which was closed as a prison in 1996 – is considered a paranormal hub by ghost hunters. It was site of 17 executions – including IRA terrorist Tom William in 1942. Carly’s tour group had been equipped ghost hunting equipment – including EVP and EMF recorders – which allegedly went crazy after the tour guides told a story about a girl named Isabelle. Ella Reeve, 30, snapped the ethereal figure during a visit to the Birmingham Back to Back museum – a 19th-century courtyard of working people’s houses run by the National Trust. The mother-of-two, from Wolverhampton, visited with her 81-year-old nan, as her late grandad was brought up in similar houses and she wanted to see how he might have lived. Miss Reeve said the historic museum gave her a ‘weird feeling’ – but she had no idea she’d captured a spooky spectre on camera until she got home and looked through her pictures. She said she is adamant there was no one else in the room and is convinced she managed to capture a ghost on camera. “My grandad died two years ago, when he was 93, and I was absolutely devastated – we were so close,” she said. “I’d heard about the museum and knew he grew up in houses like that, so I wanted to visit to get that nostalgic feeling and feel a bit closer to him. “When we went in I got a bit of a weird feeling and it was all a bit eerie – but it seemed fine when we were walking around “When we went into one room, I was left in there on my own as everyone else carried on upstairs and I decided to get a quick picture before joining them. “When I was in there I got a really funny feeling – it went ice cold, and I was all tingly and the hairs on the back of my neck stood up. But I didn’t think too much of it, and carried on around the museum. When I got home and was scrolling through my pictures, I saw on one of them there was a white mist. “I thought maybe it was just the flash of my camera. “But when I looked at the one from the bedroom, I could see a shadow – even though nobody had been in the room with me. I knew it wasn’t mine – the outline didn’t fit with my shape, and it looked like a man’s shadow. “As I looked closer, I saw there was no shadow on the bed, just the wall – if someone had been in there with me the shadow would’ve fallen on the bed as well. “It was very weird, and it sent shivers down my spine. I have two spirit photographs that were taken on two separate occasions that I’d like to show you. One was taken at the Kawaiaha’o Cemertery and the other at Oahu Cemetery. Is there an email address that I could submit the pictures to? Several of these photographs are proven fakes. Many of these photos have been circulated for years but are interesting to revisit. A few are mysterious. Thanks for the article.